Despite an early pull out of the Drag Wars competition by one of Grenada’s two drivers Joshua Lewis with his Mitsubishi Evolution 4 due to mechanical problems, Grenada’s Alan McIntyre was able secure a position in what is considered the “high powered category” with his modified V8 Ford Mustang. McIntyre placed 2nd in the ‘9 seconds’ class following two days of high speed racing despite the inclement weather which affected the event on both days. Attached is a photo of McIntyre receiving his prizes from the Absolute Promotions team who hosted the event. Also attached, is a photo of Mc Intyre as he got the green light in a race between himself and Trinidad’s Gary Smith modified V8 Mitsubishi Gallant on Saturday, 27 April 2013. McIntyre won that race doing a time of 10.4 secs at a speed of 130Mph while Gary Smith finished with a time of 10.8 secs at a speed of 108 Mph. On Sunday, 28 April, Mc Intyre did a single pass and registered a time of 9.6 secs. 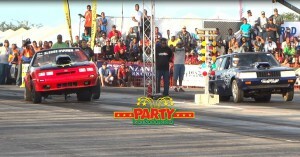 The fastest time of the weekend 8.9 secs, was done by a modified Nissan Silvia from the Trinidad’s ‘Boost Factory’ Team. 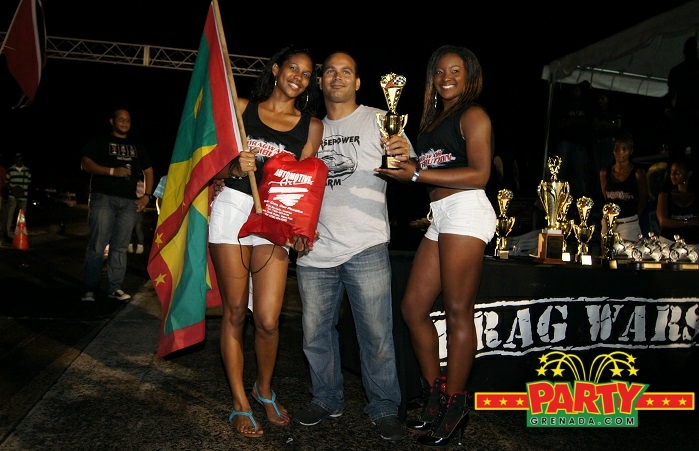 Team Grenada will issue a full review of this past weekend’s event during this coming week.